Today's cartoon is in preparation for a seminar on Meditation with Martin Hannington my church is running which should be interesting. 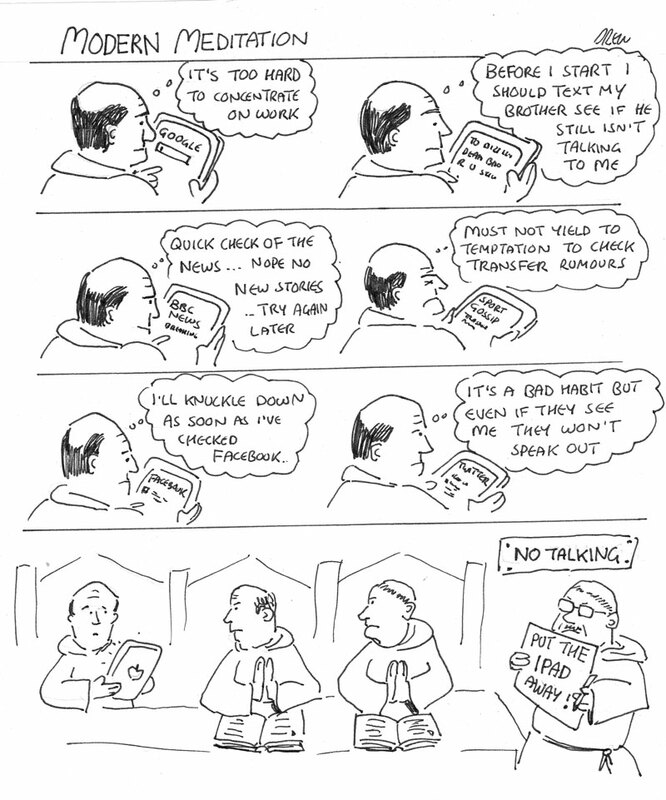 I don't know if monk's are allowed to text or use tablets (I suspect not) but it gave me a vehicle to talk about how distracting sitting in-front of a computer at work is when the temptation of tabbed browsing is always to open another tab and go look at something from the wide wide web. Even at home when you are trying to do something creative or constructive the temptation is always to check the CCGB forum one more time or Tweetbook or anything that gives you a quick hit rather than the less immediate satisfaction of focusing or creating something yourself. The slightly hand drawn look is because the cartoon is hand drawn while my office is being dismantled. Digital cartooning will return soon.